The “Fix the Subway” coalition marked its official launch in Union Square Tuesday as a vast assortment of grassroots organizations came together to build momentum for a new source of funds capable of raising tens of billions of dollars to modernize New York’s ailing public transit system. Citing near daily train delays and service meltdowns interrupting New Yorkers’ lives, organizations with missions ranging from workers’ rights, civil rights, economic equality, street safety, environmental justice, as well as a clean environment and a reliable commute, announced a push on the governor and state legislators in the run up to next year’s state budget. The group supports congestion pricing to help pay for the implementation of the MTA’s Fast Forward plan, which would modernize the subway’s 1930s-era signal technology and replace subway cars from the 1960s and 1970s, and install elevators across the system. Crowded subway car on Queens-bound 7 train. Photo: Wikimedia Commons, Daniel Schwen. With monthly subway delays more than triple what they were several years ago, on time performance hovering around 65%, and trains moving slower than they did in 1950, a newly expanded group of advocates is tackling the problem. Dozens of organizations have had enough. The coalition announced today includes the Riders Alliance, African Communities Together, American Institute of Architects (NYC Chapter), ALIGN NY, Brooklyn Movement Center, CAAAV, Chinese-American Planning Council, Citizen Action, Community Voices Heard, Environmental Advocates of New York, the Legal Aid Society, Make the Road New York, Municipal Art Society, New York City Employment and Training Coalition, New York City Environmental Justice Alliance, New York Communities for Change, New York Immigration Coalition, New York Lawyers for the Public Interest, Picture the Homeless, Red Hook Initiative, Rise and Resist, Sanitation Coalition, Straphangers Campaign, Street Vendor Project, Theatre of the Oppressed NYC, Transportation Alternatives, UPROSE, and the Women’s Center for Education & Career Advancement, and other organizations. 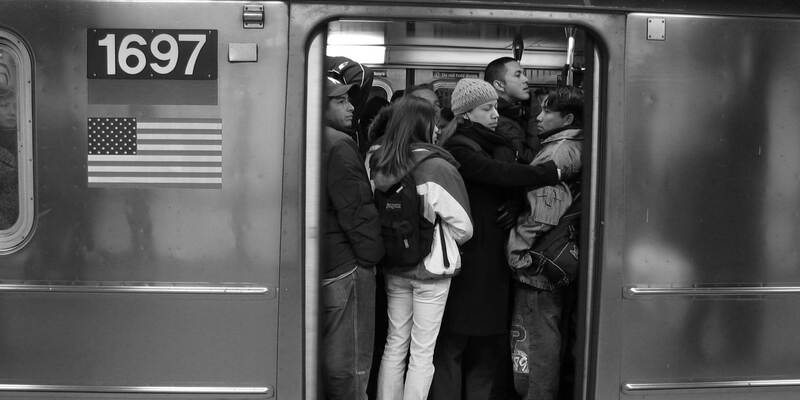 No longer, the groups say, can New Yorkers with other priorities afford to just sit on the sidelines while the transit system that whole city relies on goes down the tubes. Instead, these organizations with highly disparate progressive missions, will join up as a coalition to fight for congestion pricing to fund the MTA’s Fast Forward transit modernization plan. Congestion pricing, predicted to raise up to $1.7 billion from cars and trucks entering Manhattan south of 60th Street, would go a significant distance toward the tens of billions required to fix the subway over a decade or more. Today’s announcement by a broad coalition of progressive groups confirms that congestion pricing is itself a progressive policy initiative. Citywide, households with cars earn twice those without cars. The Tri-State Transportation Campaign found only 4% of outer-borough commuters would pay a daily congestion charge. The Community Service Society found only 2% of working poor commuters would pay the charge. Outer-borough commuters who drive to work in Manhattan not only pay for their cars, gas, and insurance, they also pay for parking and time lost in unpredictable traffic, a price comparatively few New Yorkers can afford. The majority of commuters into Manhattan rely entirely on the city’s ailing transit system to get to work and home again. In pursuit of their goal of congestion pricing as a means to pay for fixing the subway, the assembled groups vowed to hold public events and private discussions with government officials, building broad-based momentum toward next year’s state budget. The budget cycle, which officially kicks off with the governor’s address to the legislature in January, will wind up in March with a fiscal year 2020 state budget due by April 1. While congestion pricing has also been proposed in standalone bills in prior years, a revenue measure with such a significant impact on the state’s economic engine, is seen as most likely becoming part of the overall budget deal between the governor and legislature.